Get ready for the Great Indian Festival sale by redeeming the Amazon Pay Balance Cashback Offer. 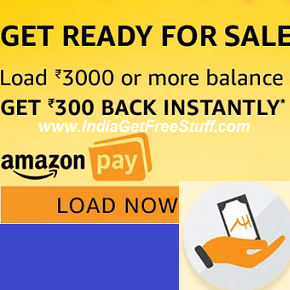 Load Rs.3000 or more balance to your Amazon wallet and get Rs.300 cash back instantly. Use extra balance to shop more. Simply follow the steps provided below. Visit here to load your Amazon Pay wallet. Load Rs.3000 or more to your balance between 28 Sep and 8th Oct 2018. Get flat Rs.300 extra balance as cashback into your Amazon Pay balance instantly. Use the extra budget to do your shopping, bill payments and recharges during the Great Indian Festival. Offer period: 28th September 2018 00:00:00 am to 8th October 2018 23:59:00 pm. The offer is valid on all electronic loads (credit/debit card, net banking, UPI) on Amazon.in app and website only and is not applicable on cash loads. The customer will receive the cashback amount within 3 days from transaction date.